UCLA's football team notched its first victory in seven years over cross-town rival USC and yet the Los Angeles Times somehow figured out a way to turn it into an A-1 story about USC. 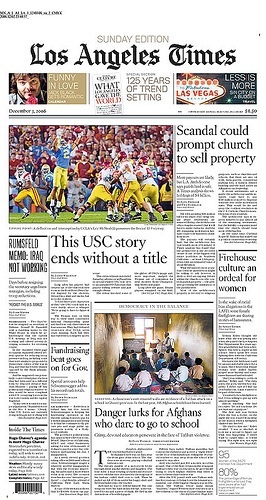 The headline on the front page: "This USC story ends without a title." UCLA's victory isn't even mentioned until the fourth paragraph of the story. I don't profess to know any secret formula to reengage readers in the LA Times, but the the wording and placement of that headline might just be the sort of thing that repels more than a few UCLA faithful. Although some of my newspaper colleagues might consider such matters to be petty, deep down they must know that readers take notice of such details. The Daily News handled it differently. Its front page trumpeted "BRUINED!" above the fold with a subhead that reads "UCLA denies Trojans title game." It doesn't take an advisory panel to figure out which front page is going to end up in more scrapbooks and picture frames for years to come. These are the kind of things readers remember.